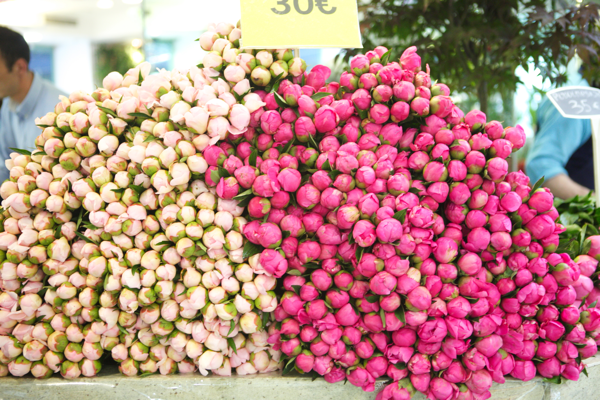 + I love this wall of peonies via Suann's pin via Oh Happy Day . I want to visit France in May just to see these beautiful piles of peonies. In related news, my own peony bush is coming along nicely. Should be in bloom very soon. + Today is a MUCH needed no school day for us, and although we will be busy going here and there, the forecast is 80 degrees. This makes me so so happy. + Madeline has really been struggling in her Geometry class so I hired a tutor to help her pass the class. In just two weeks, her grade has improved from an F to a B-. The best money I've ever spent. + I recently downloaded a new [free] list making app on my phone that is making life so much easier for me. I make a lot of lists, usually on paper, but have found that somewhere throughout my day, I misplace the list. This app allows me to use my phone, which I always have on me, and lets me check off the things I've completed. Checking off is my favorite part! + We grilled up our first burgers of the season, and for me, that always feels like the start of summer. + Today when I watched Courtney's vlog [highly entertaining! ], she mentioned her favorite music. I listened carefully, and I'm pretty sure she's listening to my 2008 November's Chill mix that I gave her. That made me happy. Plus, that's a great mix. **Listen HERE.